When you create an ICC profile, the profiling software generates a series of lookup tables based on how your printer reproduces color at that moment, with the ink, media and print mode you have chosen. An ICC profile is only a model of how your printer reproduces color at a given point in time, for a given condition; this model is static, not dynamic. Should the performance of your printer change due to any combination of ink or media change, environmental variation, maintenance or mechanical wear, the validity of the profile, and thus the accuracy of your color matches can fall in doubt. The goal of printer calibration is, therefore, to establish an optimum, known good condition for the printer prior to making the ICC profile. This condition is one you can reliably calibrated back to when a change occurs causing color drift, helping to maintain the accuracy of your profiles over time. Through the use of aim points, we can establish an optimum, known good condition for the printer. G7 is one method of calibrating any four-color process device, including digital presses, large format inkjet printers, digital proofers, and color laser printers to a common set of colormetrically-derived aim points intended to produce prints with a common, visually-consistent appearance. G7 is not color management, per se, but it does remove the subjective and often ambiguous definition of what defines a visually faithful reproduction, replacing it with an objective set of aim points based on the native media white point and CMY process black point of the printer. It does this by defining the colorimetric relationship of the neutral points lying between media Dmin and CMY Dmax necessary to produce a neutral print density independent of the ink and substrate being used. This is done for both K and CMY grayscale, and the resulting ink curves are referred to as Neutral Print Density Curves, or NPDC. These curves replace the traditional (and less effective) linearization curves still in common use today. While the G7 method is relatively new to the digital print world, it is an ANSI standard; the formal specification, including aim points, viewing conditions and print requirements is described in ANSI/CGATS Technical Report TR015-2015, published by the American National Standards Institute’s Committee for Graphic Arts Technologies Standards. The specification is available free of charge for download from the NPES under the CGATS Technical Reports section. 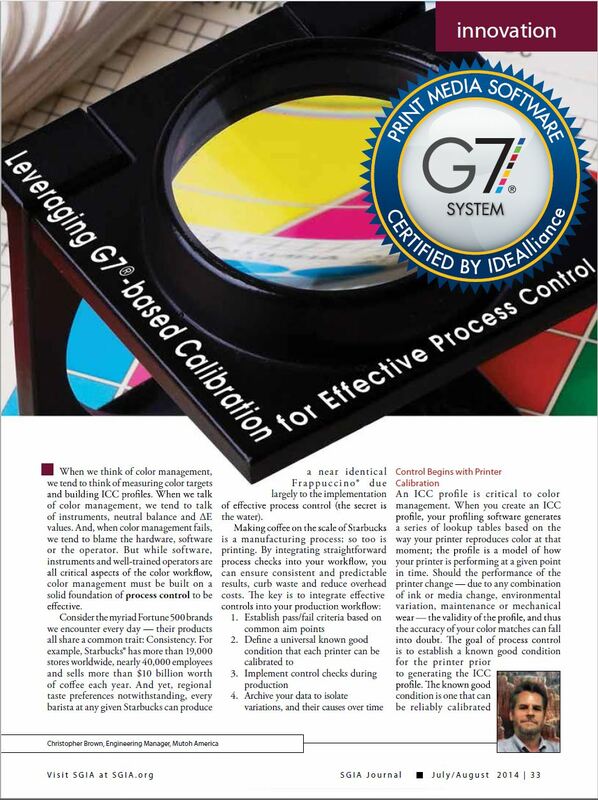 For consultants and print providers, the G7 Professional and Expert Certifications, and G7 Master Qualification programs are maintained by the Print Properties and Colorimetric Council of IDEAlliance. G7 and the G7 logo are registered trademarks of IDEAlliance; visit idealliance.org for details.